I am looking in to getting a light bar for my tb. I was just wondering what size and problems if any have happened with anyone. Mounts available for it? My first post! I've been lurking around for about 6 weeks now fixing up a 05 Trailblazer my brother gave me. Thank you all, and MarkMC, i will be in touch soon. 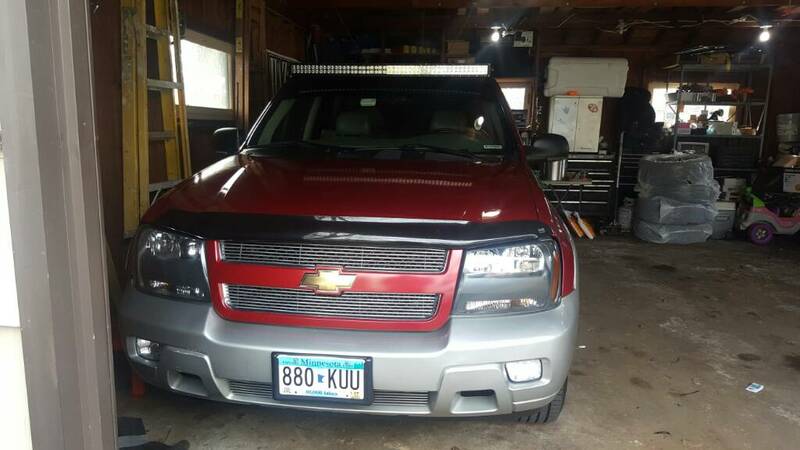 Did you ever figure out the light bar dilemma? I am considering some smaller bars behind the grill above or below the bow tie and some form of bracket there. Single row bar would be very slim and would still allow for proper cooling even here in Texas. Anyone ever considered removing the luggage rack from the roof? People remove the roof racks all the time. I made mine work by ordering some brackets for a 09 Silverado and with a little bit of trimming and elbow grease they work amazing! 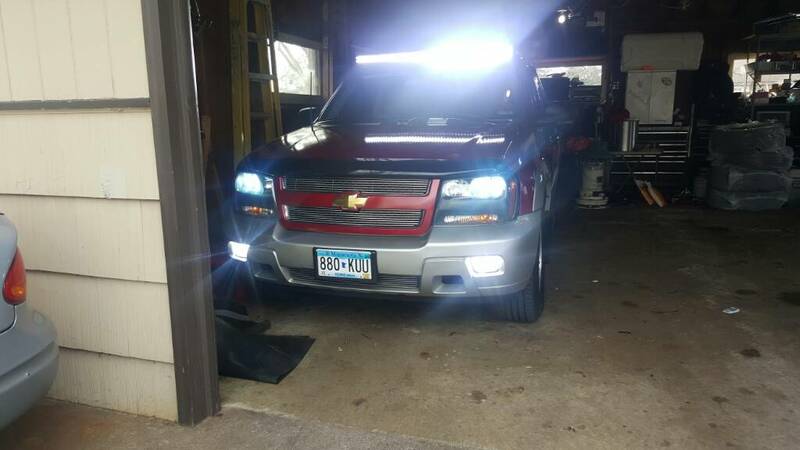 I had to redrill the mounting holes for the light bar but it worked! What did you guys do for the weather stripping to stop the wind noise from that. Not the whistle from the light bar. Was wondering the same. I've been wanting to do the same for a while but didn't know how to attach it. trying to place a pic.... not letting me ! (kelly.bell.169067) send them on messenger if you want to see them! I couldn’t find any brackets when I got mine or anything that was close so I just bolted mine into the roof. Drilled holes through the roof, tapped threads in to match the bolts I have, then packed the hole and the bolt threads full of weatherstrip adhesive, as well as put it all on the underside of the basic mount the light bar came with. 1 year and several car washes later, absolutely no leaks. I went with a cheap 48” curved light bar off of eBay (solid white and solid orange, strobes both colors individually and flashes between the 2 colors as well) and have about 2” of room on each side. You could probably fit a 50” curved, but don’t drill through your roof unless you plan on using a ton of that weatherstrip adhesive to prevent leaks. Also put a bull bar with 2 7” light pods on, LED low and high beams and LED fog lights. Possibly the brightest envoy out there! !